8 1/4 (8 3/4, 9 1/2)" hand circumference and 10 1/2 (11 1/4, 12)" long from bottom of cuff to tip of fingers. Mittens shown measure 8 3/4". 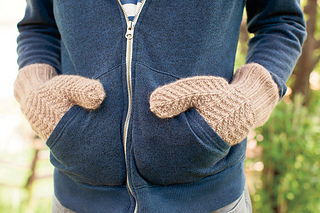 -Finished Sizes: Mittens 8 1/4 (8 3/4, 9 1/2)“ hand circumference and 10 1/2 (11 1/4, 12)” long from bottom of cuff to tip of fingers. Mittens shown measure 8 3/4”. Yarn: S. Charles Collezione Ivy (100% cashmere; 125 yd 115 m/1 3/4 oz 50 g): #100121 taupe, 2 (2, 3) balls. -Needles: size 4 (3.5 mm): set of double-pointed (dpn). -Notions: Markers (m); tapestry needle; waste yarn. -Gauge: 21 sts and 34 rows = 4” in charted patts. 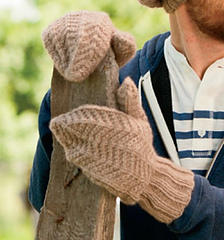 Men’s mittens with ribbed cuffs and knit and purl body pattern. The left and right are identical for easy wear!